Rolling Ant were pleased to participate in the 2017 Immersive Architecture conference held on June 1st to June 3rd in Venice, Italy. Held in the grounds of the University of Venice, San Servolo campus, the conference was sponsored by CGarchitect, V-Ray (Chaos Group) and Unreal Engine amongst other luminaries in the field of AR, VR and architectural visualization. The event brought together a diverse group of industry leaders from across the globe and was a wonderful opportunity share experiences and learn what other companies are doing to push the bounds of technology and content creation in this field. 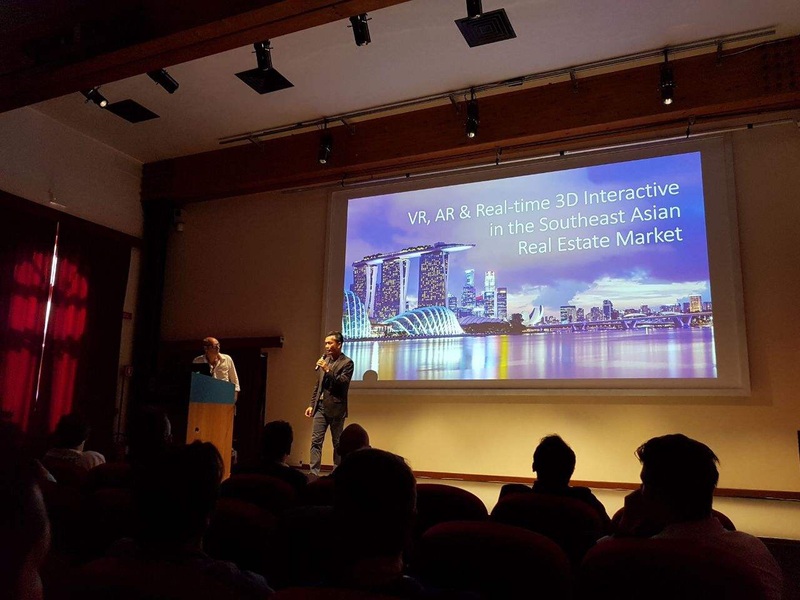 Nam Hoai Nguyen (CEO) and Robert Cianchi (Art Director) gave a 40 minute presentation on the current and future states of AR, VR and Interactive Realtime 3D in Southeast Asia as well as talking about some of the unique issues we face in the region and how our solutions and pipeline have been developed to overcome these. As well as two days of talks and round-table discussions, the event also gave us a chance to show our work to industry peers as well as check out how other people are using this medium in interesting ways. The exchange of ideas was inspiring and we look forward to implementing some of what we have learned in future projects. Rolling Ant are proud to have been invited to participate in the recent conference “Museum of the XXI Century and New Media Technologies” hosted by the Hermitage museum in St Petersburg, Russia. Attended by some of the most prestigious museums in the world, the event focused on the use of cutting edge technologies in the museum space. The conference was attended by our own Charles Speyer and Robert Cianchi with a keynote address presented by Robert Cianchi on the benefits of the 3D digitalization of museum buildings and collections, AR and VR in all key areas of museum practice. The presentation was accompanied by a VR demonstration available throughout the event that allowed participants to explore a reproduction of the Hermitage’s Large Italian Skylight Room using HTC’s Vive. The demo was widely praised by participants both for the high-quality of the 3D and also for the fact that viewers were able to remain immersed in the virtual gallery for as long as they desired without any feelings of nausea – a testament to the skill of the Rolling Ant team! The talk itself covered everything from the initial 3D scanning of collections and creation of virtual museum spaces in 3D to the various benefits to museums of having their collections stored as digital assets. The first topic broached was the use of 3D scan data in archiving and conserving the collection as well as allowing public access to works that would otherwise be too fragile or valuable to display. The discussion then moved on to usage in internal situations such as curating virtual exhibitions for real spaces and how this benefits both curators as well as the support staff such as registrars and preparators, allowing all parties involved to give their input and solve any potential issues long before physical production begins. Moving on to public facing tools Robert demonstrated how the scanned digital assets could easily be re-purposed for use in marketing, informational and educational tools on many platforms including mobile, touchscreen, web and VR/AR. Finally, the talk concluded with the topic of 3D printing and how these assets could be used to physically reproduce replicas for use/display in other institutional spaces or for educational purposes as well as the option to monetize assets by allowing the public to purchase the digital files to download and print themselves. The talk was presented in conjunction with Rodney Cook – president of the National Monuments Foundation in the USA - who discussed how giving the public access to virtual museums and collections would drive traffic to the physical spaces rather than decrease the need for people to visit in person. He also talked about the benefits for public institutions in being able to present their entire collections while physical limitations in gallery space limit what can be displayed publicly to a very small percentage of a museums total portfolio. Known as the ultimate award in the 3D Visualization field, Rolling Ant is proud to have been nominated as one of the finalists in the 'Interactive' category for our work on the re-development of Nguyen Hue Boulevard. With over 30 entries from 18 countries the winner will be announced at the Mundos Digitales conference in La Coruna, Spain on July 11, 2015. As Rolling Ant is constantly growing, we had to find a solution for space. On December 15, 2016 we have finally moved to a new office. REE Tower is a pioneering premium grade office tower strategically located just inside district four, less than five minutes from the central business district of Ho Chi Minh City. Another big step for us, a perfect place for working together, a very joyful one indeed.. The re-development of the Nguyen Hue area of downtown Ho Chi Minh City has been announced. Rolling Ant was excited to have been responsible for the interactive visualization of this project. Oculus Rift Dev Kit 2 Arrives! The much anticipated Rift Development Kit 2 finally arrives and our team is excited to start testing out the possibilites. Having already completed a number of solutions for clients using the original Dev Kit we are looking forward to start pushing the boundaries of our VR work with the higher resolution and new features provided in this release. Some of our solutions showcased at this year's Realcomm conference in Las Vegas have been featured in the teaser video for NAIOP Development '14. By far the most exciting technology solutions featuring at Realcomm, conference visitors were blown away by the quality of our realtime interactive visualization products for the real-estate market. Rolling Ant teamed up with Pix (a Pavonis group company) at this years Realcomm 2014 Las Vegas expo to show off some of our newest work. We have now expanded our hands-free expertise to include the Leap Motion controller. While we have already been creating solutions that work with Microsoft's Kinekt, we are excited to be able to add the Leap Motion as an alternative for more precise hands-free control for our VR, kiosk and desktop solutions.